A final tally of the space shuttle program's lifetime costs puts the price tag at $1.5 billion per flight, a new analysis shows. The analysis reveals that, as of the end of 2010, the space agency had spent more than $192 billion on the fleet since its inception in 1971, researchers said. That suggests that by the end of this year, which includes three more shuttle missions, NASA will have spent $196.5 billion on its storied space shuttle program. On April 12, NASA will celebrate the 30th anniversary of the space shuttle program. But despite all of its accomplishments, it never came close to meeting its expectations. 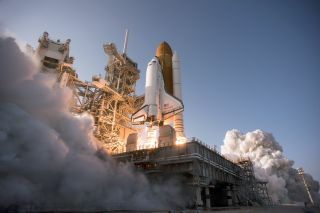 The space shuttle was originally sold to Congress as a vehicle that could make spaceflight cheap and frequent, said Roger Pielke Jr., a science policy expert at the University of Colorado in Boulder who led the new analysis. "Consider that it was originally expected to fly into space about once per week," Pielke told SPACE.com in an e-mail. "Its actual flight rate was one-tenth of that. It was never like an airliner." NASA arguably flew the shuttle as often as it could, but always at great expense, Pielke said. NASA has launched 131 shuttle missions through 2010 and experienced two tragic disasters: the seven-astronaut crew of shuttle Challenger in 1986, and the seven-person crew of Columbia in 2003. NASA has scheduled the final two shuttle flights for later this year. The shuttle Endeavour will launch on the 134th shuttle flight on April 29, with the Atlantis orbiter pegged for a late June liftoff on the agency's final mission, STS-135. The original shuttle fleet cost projections were based on just eight years of historical flight rates and costs. But that proved enough data for Pielke and Radford to come up with ballpark figures. The average cost per launch was about $1.5 billion over the life of the US space-shuttle programme, according to a University of Colorado-Boulder analysis. Both the American public and policymakers should recognize that spaceflight programs represent a "risky, expensive and long-term commitment," Pielke said. He also emphasized the need to design programs with greater flexibility than the shuttle and station, so that the programs could evolve based on changing circumstances. NASA likely knows those lessons already, Pielke said. The space agency has contracted commercial spaceflight provider SpaceX to deliver astronauts and supplies to the International Space Station. Pielke and Byerly published their assessment in the correspondence section of the April 7 issue of the journal Nature. Jeremy Hsu is a senior writer for InnovationNewsDaily, a sister site of SPACE.com. You can follow him on Twitter @ScienceHsu.